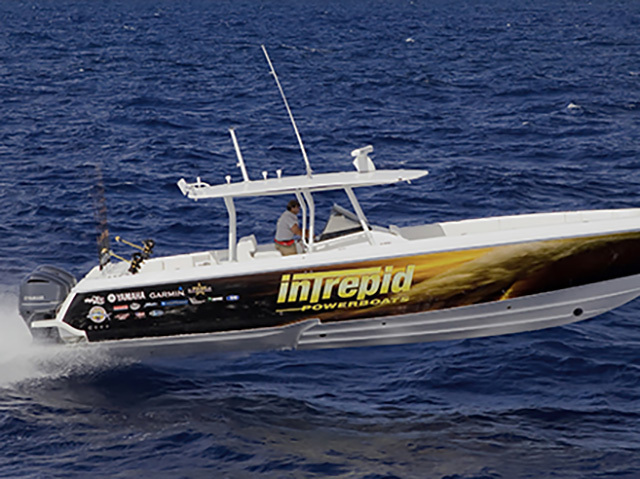 Engine trim and trim tab systems improve performance, efficiency and ride.. Learn the trim settings for your particular boat and enjoy a better ride and reduced fuel consumption. Outboard boats have two systems designed specifically to control trim: the trim and tilt system that is part of the outboard engine(s), and a pair of electric or hydraulic trim tabs that are mounted at or just forward of the transom and flush with the running surface of the hull. If you're running a new boat for the first time, you'll have to familiarize yourself with the proper trim settings, and that takes a little practice time. This properly trimmed planing hull rides high and level on the water, reducing the amount of wetted surface and friction for a smooth, fast, fuel-efficient ride. 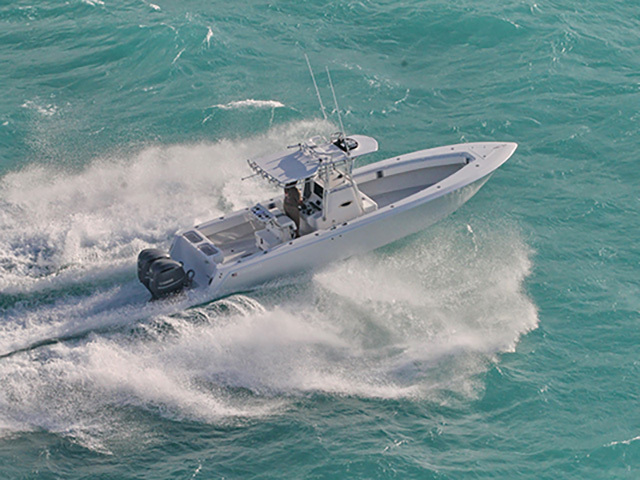 This center console is a good example of a stepped-hull deep vee. These designs have very little bow rise under initial acceleration and as the boat gets up on the steps, the riding angle will be far more level to the surface of the water. A properly trimmed boat has two very beneficial results: reduced fuel consumption and increased speed. The more a boat's hull planes -- or rises up out of the water -- the more it reduces the amount of surface actually in contact with the water. Keeping the boat balanced fore and aft and on an even keel affects how efficiently a boat will run. 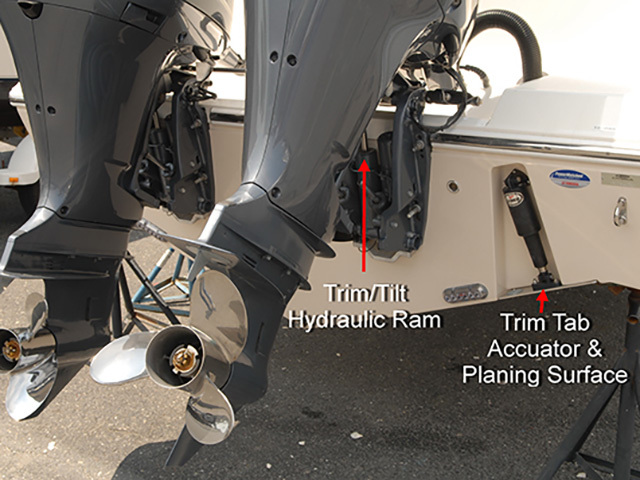 Outboard boats have two systems designed specifically to control trim: the trim and tilt system that is part of the outboard engine(s), and a pair of electric or hydraulic trim tabs that are mounted at or just forward of the transom and flush with the running surface of the hull. Let’s look at the two systems to get a better understanding of what each does and how they work together. Most outboard engines over 70 horsepower come with a trim and tilt system that is driven by a hydraulic ram located in the center of the engine mounting bracket. Its function is to raise and lower the engine, and it is controlled by an “up/down” rocker switch built into the shift and throttle control that is located directly under your right thumb for ease of access. For boats with more than one outboard, the switch will operate all the engines simultaneously. In the “tilt” mode, the system raises the engine completely out of the water when not in use. It can also be used to raise the engine when running the boat slowly in very shallow water to prevent propeller damage. 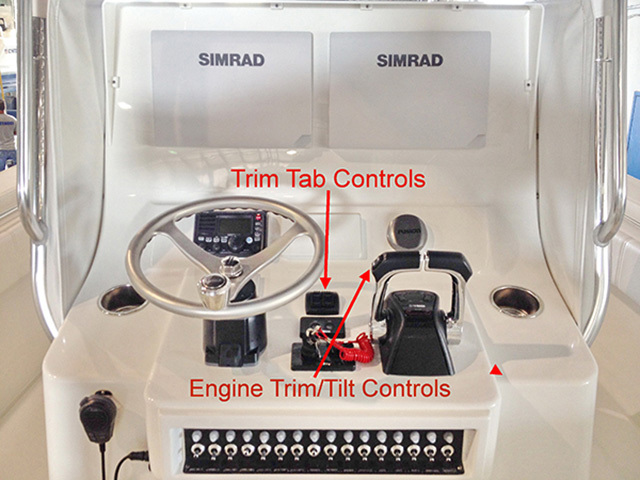 In trim mode, the system works to adjust the angle of the engine to affect the running angle of the boat. As the boat increases speed, the engine angle provides the lift necessary to bring the boat on plane for optimal performance. In the full down position, the engine is in “negative trim,” meaning the angle of the engine shaft and propeller is slightly forward of straight down in relation to the transom. This is the position the engine should be in before throttling up from a dead stop. Negative trim exerts downward force on the hull to reduce bow rise that is common to most planing hulls under initial acceleration. The harder the initial acceleration, the greater the tendency the bow will rise. If you throttle up hard from a dead stop, (a procedure called “hole shot”) some hulls will lift the bow at a severe angle momentarily until the downward force of the engine counters the rise. As the boat picks up speed, the bow will settle in and negative trim will become a hindrance to performance because it will inhibit the hull from getting on plane. Now is the time to raise the engine using the trim switch on the throttle to change the angle from negative to positive trim. To find optimum trim at cruising speeds, raise the engine slowly until you start to feel the hull rise. As it comes on plane, both engine RPM and speed will increase without changing the throttle setting, and the steering will feel lighter. Those are all effects caused by the hull rising on plane, which reduces the amount of bottom in contact with the water. Less hull contact equates to less friction, more speed and less power and fuel to push the boat. If you’re new to boating or if you’re running a new boat for the first time, you’ll have to familiarize yourself with the proper trim settings, and that takes a little practice time. Go through the motions of running the boat from a stop to where the boat comes on plane (on most planing hulls that can range from 20 to 30 MPH). Raise the engine and watch the trim gauge to note the position where the RPM and speed increase and the vessel gains the greatest performance benefit. If you over trim the engine, you can lose hull efficiency. This can be identified a few different ways. As you increase the throttle setting, RPM will continue to climb without a corresponding increase in speed. When over trimmed the bow might begin to rise and fall rhythmically, which is called porpoising. Extreme over trim can cause the propeller to lose its grip on the water, a situation called cavitation. When you run the boat at higher and higher speeds, you can typically increase the engine trim angle above the optimal setting for cruising, but there is no specific set trim angle for every hull at every speed. 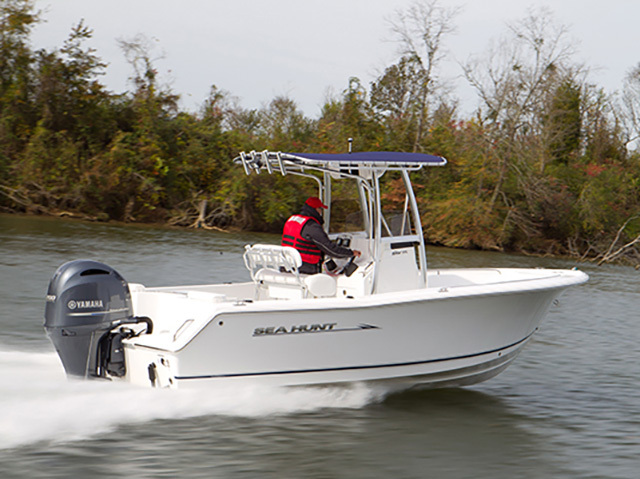 It’s how the boat feels and performs that sets the bar. Trim settings vary from boat to boat and with the amount of horsepower you have strapped to the transom, so every boat is a learning experience. Once you find and get used to the correct balance of speed and trim angle, it will become second nature. A quick note on stepped hull boats is in order. The stepped hull deep-vee design has become very popular in recent years, and it works a little differently than traditional modified or deep-vee hulls. The steps notched into the bottom of the boat force air under the hull to reduce friction and wetted surface. The power trim system on the outboard engines driving a stepped hull is just as important, if not more so, but the hull’s response to trim is different. These designs have very little bow rise under initial acceleration and as the boat gets up on the steps, the riding angle will be far more level to the surface of the water. Raising the engine angle will have a definite effect, and many stepped hull boats can tolerate a greater degree of positive trim than their non-stepped cousins. You can feel the boat get on the steps and increase speed, but the transition is more subtle. Once you get used to the feel, you’ll find stepped hull performance to be faster and more aggressive. Trim tabs are your other performance enhancing tools. They consist of a pair of planing surfaces attached to the transom or tucked into pockets in the hull at opposite sides of the transom. Trim tabs are pushed down or retracted with electric or hydraulic rams, also called actuators. Each tab is operated independently from paired switches at the helm. Each switch is marked “Down” on one side and “Up” on the other. Down refers to the effect it will have on that side of the boat. At the risk of being confusing, here’s how they work. When you depress down on the left switch it causes the tab on the opposite or right (starboard) side of the transom to lower. As it does, it exerts a downward force to the port side of the boat. Depress down on the right switch and the tab on the left (port) side of the transom exerts a downward force on the starboard side of the boat. Trim tabs are used to keep the boat on an even keel while running. For example, if you have more people or weight toward the port side of the boat, it will lean to port while underway. Simply depress the starboard side trim tab switch until the boat levels out. Same procedure if the boat is unbalanced to the starboard side. Maintaining an even keel aids the efficiency and ride quality of the hull in both calm and rough water. A boat running on an uneven keel loses a degree of efficiency, but it can also cause the hull to slam on that side when moving through waves. Trim tabs can also be used to help adjust the angle the bow strikes waves under various sea conditions. When you have the boat trimmed and on plane, you can add or reduce downward pressure on the bow by adjusting both trim tabs simultaneously. This adjustment can help the boat slice through waves in a head sea more efficiently and with less impact. Keep in mind that adjusting running attitude in this manner is very much a matter of feeling how the boat is performing. Boat speed, engine trim and trim tab settings will be different with varying sea states and severity and it takes experimenting with each to find the “sweet spot” for changing conditions. Outboard power trim and tilt systems and trim tabs are critically important tools for running your boat more efficiently and safely. Their proper use greatly augments the way the hull is designed to perform in calm water, whether you boat on lakes, rivers, bays or in the open ocean. They are absolutely priceless when running boats in rough water and can help you turn a rough ride into a soft one with just a little practice.